One of the more bizarre things in the body is the network associated with the visual sense. When you step back from the detail of the anatomy and look with simple eyes! you see the visual tracts weave through the entire depth of the cranium from the eyes themselves to the visual cortex at the back of the head. There’s a two neuron pathway that sweeps past the brain stem into the occipital lobe. I often wonder why? After all, the ears have their interpretive centre in the temporal lobe right next to the auditory system, therefore the vestibulocochlear nerves are short and the tracts from the brain stem to the temporals also short. That all makes sense and seems to be an efficient use of space and neurons. There must be all kinds of other possible organizations for the visual pathways. Why not put the interpretive centres just behind the eyes, say in part of the frontal lobe? Why have fibers reaching through the limbic system? There has got to be a reason. It could be the brain is too involved in association in the frontal lobe and there’s some spare cortex in the occipital lobe, after all it’s a bit quiet back there without a face or any sensory apparatus! So stick the visual centre there. I get that. Good architecture. However when you look at the embryology of the eyes you totally understand the reason why ~ as ever the answer lies in the formation of the body. It’s all to do with the way the cerebrum has grown, from the front to the back then out to the sides. The eyes started forming early. They are a complex and big sensory organ and in many ways are the most important sense so they started growing early in the fourth week after conception. The brain’s growth left the eyes at the front but somehow attracted the optic nerves to grow directly backwards simultaneously with new brain growth. That’s so wild. How do nerves know where to grow. How did the optic nerves know to cross over and to synapse in the sides of the mid brain? And then carry on in a sweeping movement to find the occipital cortex? It reminds me a bit of the rise of the kidneys elongating the ureters or the descent of the diaphragm lengthened the phrenic nerves. There are plenty of other examples. However in this case the optic nerves aren’t being pulled there they are growing there as if by some homing instinct. 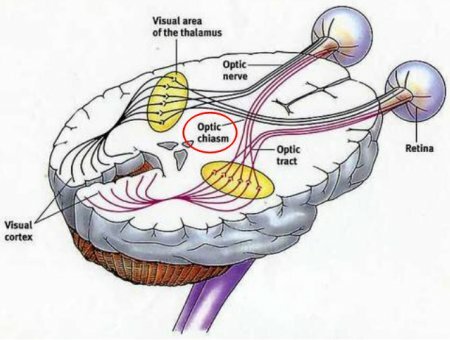 Whatever the mechanism the optic nerves move through the diencephalon, synapse just below the thalamus and move on to the occipital lobes creating two arcs of light stimulated enervation that pass right by some of the key sites in the whole body. Is that a coincidence? The main one is the pituitary, literally and almost bizarrely the stalk of the pituitary passes just behind the optic chiasm. So above the chiasm is the hypothalamus and below the pituitary. You’ve got to be kidding? 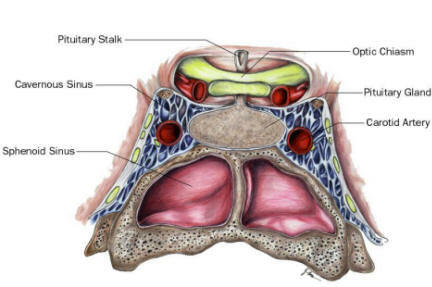 I remember when I first spotted this in an anatomy book I simply couldn’t believe it. My imagination ran riot around light entering and illuminating the centers of the neuroendocrineimmune system, arguably the centre of the whole body system ~ suddenly it was related to light waves (ok nerve stimulation from light) and therefore the centre of the brain wasn’t such a dark place after all, it was a place of light. There’s a neural flow moving right through the Hypothalamic-Pituitary complex that may provide stimulation or a reference beam or connection to the outside world that the master gland and core neural centers need in way we don’t yet understand. If you want to get to your pituitary, this is the quickest way. Simply tune into the back of your eyes with your eyes open. You will feel a very active retina, then just follow the neural flow backwards (that’s the way it flows) and it should feel like you are cross-eyed for a second as you move through the optic chasm which is where fibers partially cross before moving to the lateral colliculi on the sides of the midbrain at the top of the brainstem. This is where the optic nerve fibers synapse with neurons of the optic array which fan out as they bring sensory information to the occipital cortex. Now you can feel that you see from the back of your head. Seeing is not in the eyes. Once you have the optic flow you can easily identify the chiasm which is like a chicane in the pathway. Let your attention linger here for a while and think of the image of a small grape hanging from the underside of the brain. The pituitary is like a brain grape sitting at the centre of the sphenoid and therefore the cranial base. You will sense it as sitting underneath the chiasm. There’s a wonderful sense of centering when you rest your awareness here and as you stay, a potency will start to arise in that feels vibrant and health giving.